There’s a wonderful image that appeared on social media sites recently. 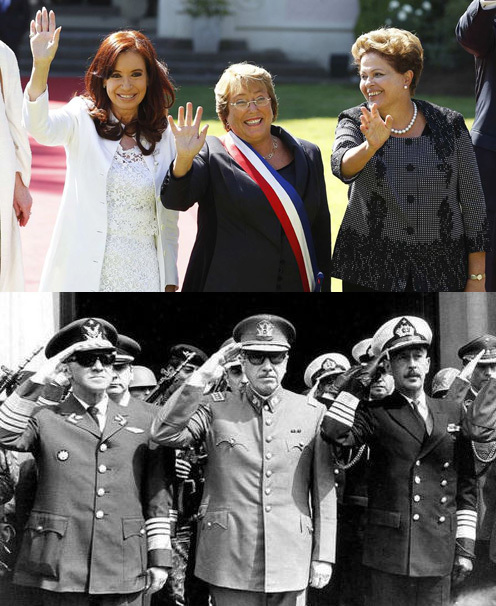 It features the current presidents of Argentina, Chile and Brazil compared, supposedly, with their counterparts from 35 years ago. The smiling women versus the glowering men. These contrasting images say a lot about the journey Latin Americans have traveled since Operation Condor, the United States government-backed operation that disappeared some 60,000 citizens in Argentina, Chile, Brazil, Peru and Uruguay. It’s a chapter of history many in the region would like to forget, but the victims and children of the victims refuse to collaborate with such selective amnesia, as evidenced last week when a former military president was sentenced in Buenos Aires, and this week when an Italian judge ordered 21 surviving military officials from the region to stand trial for murders they ordered during their dirty wars. I witnessed this recently while in Argentina and Bolivia, where I went to document some of the great work that Church World Service does in the Chaco, a vast and biologically diverse expanse of grasslands and dry forest that spread across three countries. With growing international concern about deforestation in the larger Amazon basin to the north, foreign corporations seeking land to feed China’s hunger for soybeans have come to the Chaco, where indigenous communities in Argentina, Boliva and Paraguay are facing off to defend their lands and culture. Women are leaders in many of these struggles. That’s no doubt due, at least in part, to the matrilineal nature of many indigenous communities. When a couple marries, for example, the man goes to live with the woman’s family. Yet decision-making power in the home doesn’t always translate into power outside, where indigenous men–more likely to speak Spanish, the dominant language–will often control transactions in the marketplace. Even if they run things in the house, it nonetheless takes real courage for women at the margins to speak up in political debate. Yet of courage there is no shortage. “It’s we women who are struggling to change things, and because our men are busy working we have to take leadership. So when we have confrontations with the politicians, whether in their offices or in the streets when we protest, it’s we women who are at the front. And it’s gotten to the point where the politicians are afraid of us. When some provincial officials came to our community recently to respond to our protests about lack of schools, we had to chase after them. They tried to hide from us. 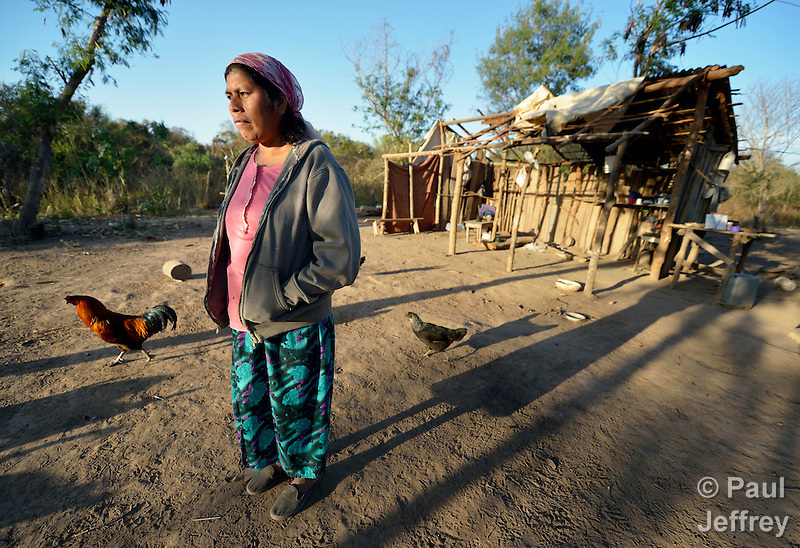 They told people they were afraid to face the women of this community,” Nelida Alpiri told me. 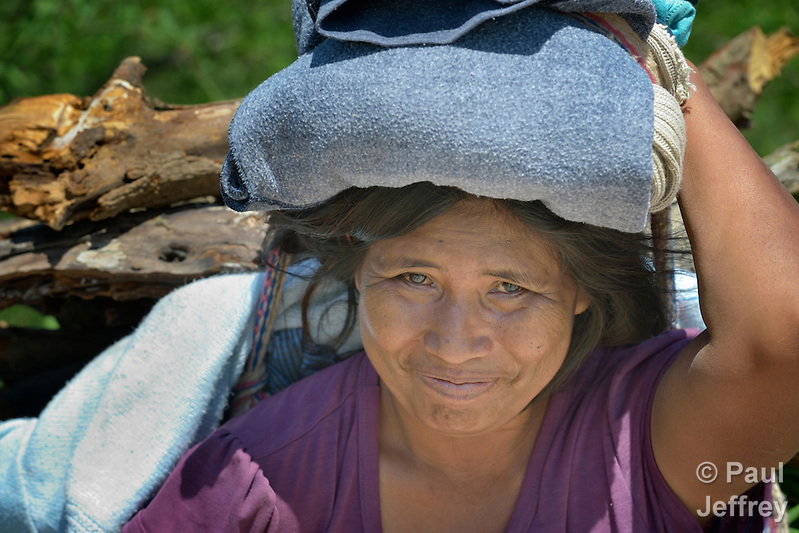 She’s a leader of a Guarani indigenous women’s group in El Bananal, Argentina. She’s in the middle here, with Sonia Jimenez on the left and Noemi Ortega on the right. The group of 11 women came together to make bread and empanadas and sell them to raise money to build new bathrooms for their homes. It’s a slow process. They’ve been at it two years, but they’re slowly raising the money needed to buy the construction materials they need. It’s worth noting, it’s precisely that specific desire for what they call “dignified bathrooms”–an example of improving the quality of life of their families–that drives the women’s political involvement. It’s not ideology. That was what the scowling generals claimed back in the 70s. With Henry Kissinger scowling right behind them, they used that as an excuse to torture and kill. But the times have changed. As Jimenez told me, “We women are in charge here. If we’ve got a woman as president, then we women have the right to rule everywhere in the country.” Her friend Ortega responded, “We’re going to have problems when we someday elect a man as president. We won’t ever be able to serve dinner late again.” The women laughed. 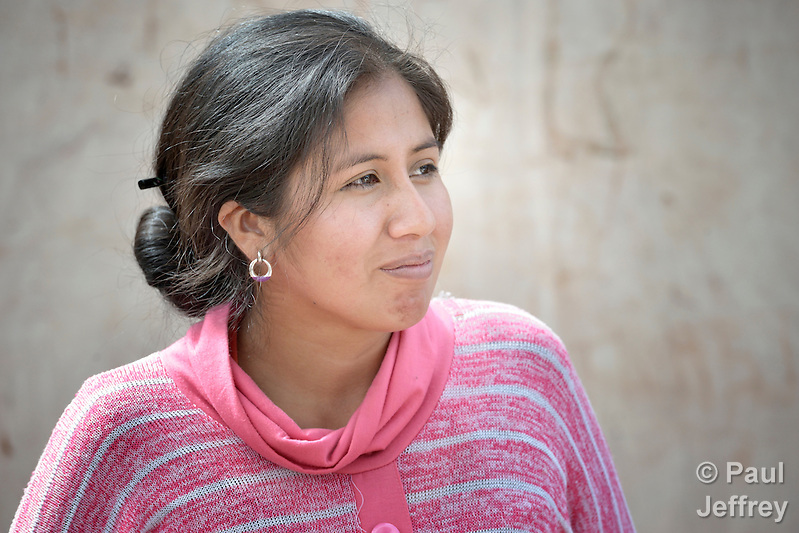 Church World Service and church activists are supporting the women’s struggles in El Bananal and elsewhere in the Chaco. Yet, not surprisingly, some of the church activists have struggles of their own. 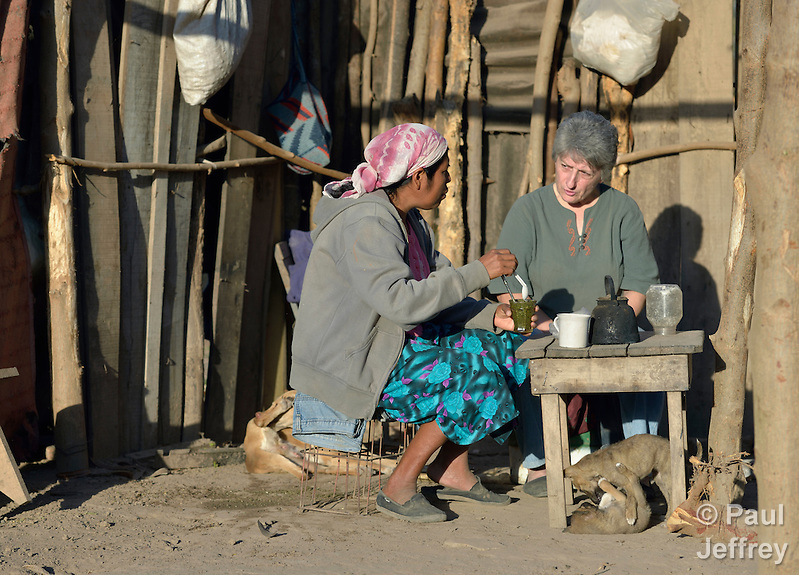 Take Norma Chiappe, a Catholic nun who lives in an indigenous community in Embarcacion, Argentina. She and the other sisters there have a great ministry of presence, a model of accompaniment that sometimes conflicts with a hierarchical model of church. “We sometimes have problems with priests, who come in and announce, “I’m the man here.’ But it’s clear to everyone here that we are all the church. The church isn’t the bishops and priests. It’s all the people,” Chiappe told me as we walked the community’s dirt streets early one morning. A member of the Franciscan Missionaries of Mary, Chiappe said her order came to Embarcacion in 1956 when the owner of a giant sugar plantation requested their presence to staff a small clinic and provide catechism for the workers’ children. 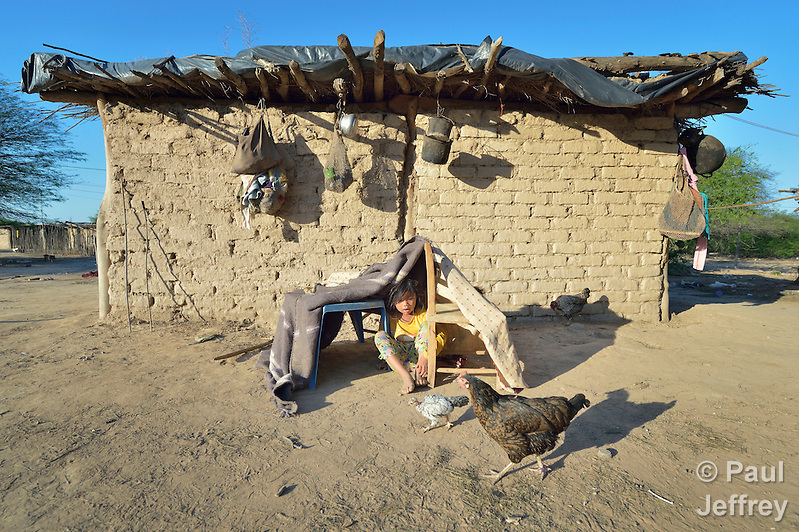 The owner built them a house. “The owners were what we then called ‘horribly Catholic,’ meaning they came from the extreme right,” she said. Over time, the sisters slowly wised up to how they were being used to help provide a spiritual patina to oppression, and in 1979 they decided to leave. “The owner didn’t want us to leave, and he couldn’t understand why we were upset. He said it wasn’t his fault that God had created some peopole rich and some people poor,” Chiappe said. The nuns decided to stay in the community, however, and moved into Lote 75, a poor neighborhood where all the indigenous lived. 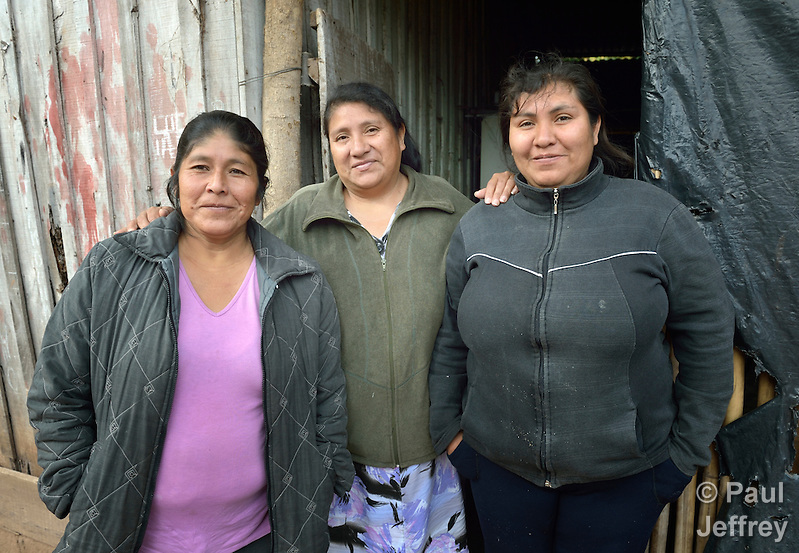 Recognizing the value of women’s labor is an issue in many places, and one that Alba Rostan wrestles with in the Chaco. She’s a founder of the United Mission Board, which was started in the Chaco by Argentinian Methodists and Disciples of Christ in the 1960s. Rostan accompanies several indigenous communities near Castelli, supporting efforts by the region’s original peoples to get back land that’s rightfully theirs. 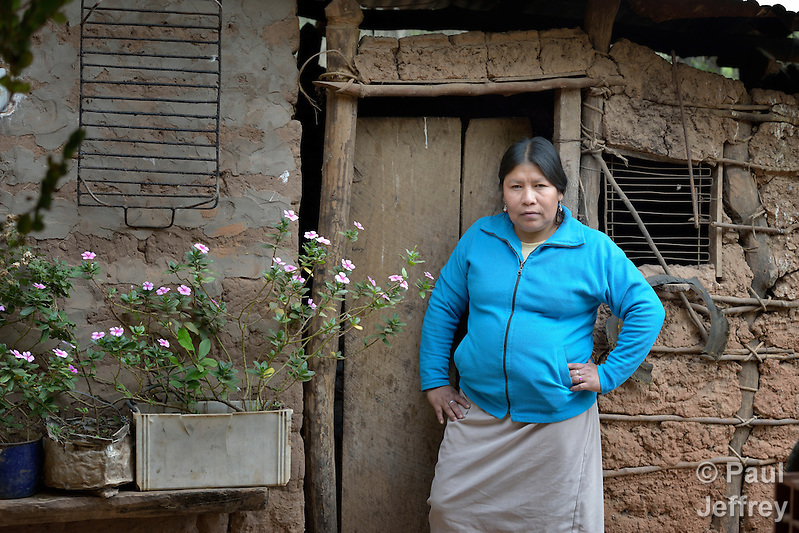 (In Argentina, indigenous communities are often labeled as “invaders” for trying to occupy their own land.) 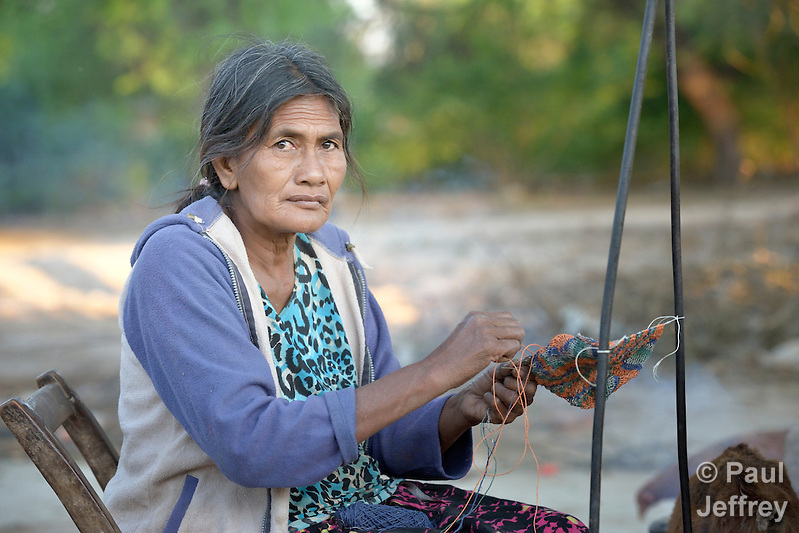 She’s working with some indigenous women to help them value appropriately the work they do in crafting jewelry and baskets and other traditional items which they sell to support their families. Trained in business administration, Rostan says the women artisans have to live with the rules of the market. “That means we have to put a real cost on a basket they make. So I ask them. ‘What does a palm frond cost you?’ They have no idea. ‘How many hours did it take you to weave this?’ They have no idea. ‘How much time did it take you to find the material for this button in the forest?’ They have no idea. So we get out paper and pencils and we calculate and draw diagrams and they end up being surprised at how much goes into producing something like a basket. When they learn the real cost of what they’ve created, they’re shocked, because all their lives they’ve given away their labor to people who have ten thousands times what they have,” Rostan said. “It’s a kind of slavery of the mind. So we talk about self-esteem and gender, and they come to accept that their time is worth as much as anyone else’s time. And in pricing something we have to take into consideration that some natural resources are getting harder to find, and that has an effect on the price. We finally come up with a real price, but they often think that simply because they’re indigenous women, and often illiterate, they don’t have a right to charge that,” she said. In a quest to break out of the limited marketing opportunities represented by church and solidarity groups, with help from CWS Rostan has brought some young design students from Buenos Aires to Castelli. It’s a shock, she says, for the young urban women to be exposed to poverty they didn’t know existed in their country. But they have quickly developed a creative partnership with the indigenous women, tweaking some original designs in small ways that make them appeal to a larger group of buyers. This can be a dangerous road to tread. I’ve seen what happens to native weaving in Guatemala when artisans try to create products that appeal to tourists. You end up with some colors, for example, that have no right to exist. Rostan, however, is confident they can preserve quality and authenticity, but she insists the indigenous have a primary right to survive. “Some anthropologists may argue with me, but at the end of the day the women need to figure out how to get food into their house. If they don’t have bread on their table, what does the argument of anthropologists matter? It’s very easy for anthropologists to say what they want when they’re sitting there with their coffee and air conditioning. For them to insist that others continue living purely as indigenous in the forest with their traditional customs, that’s all well and good. But they should go live like them and then tell me if things need to change or not. We want to preserve identity at the same time we adjust to the market of today. That’s what will help them live. If we don’t figure out how to do this, there won’t be any identity for the anthropologists to study, because people will have moved to the city or stayed home and died of starvation,” Rostan said. Basket styles aren’t the only things that are changing in the Chaco. 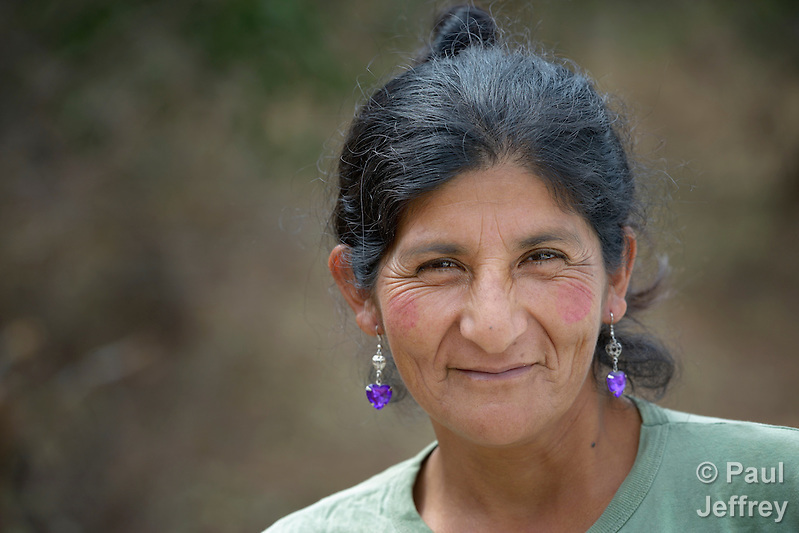 Across the border in Bolivia, I met Catarin Seron in the village of Mberirenda. 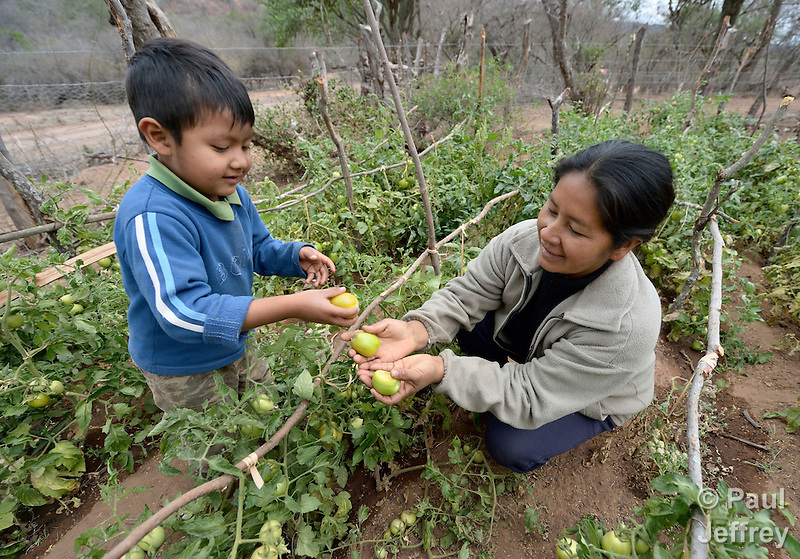 The 24-year old Guarani woman has participated in some workshops on leadership for young people sponsored by CWS, and she’s wasting no time putting what she learned into practice. She’s leading her village in a fight for land they believe is rightfully theirs, but which was “bought” decades ago and converted into a plantation. Seron’s struggle isn’t just with outside usurpers, however. It’s also a battle with other generations within her own community. “This land was taken from our grandparents. We want it back for a place to live and for our children to grow up. The little piece of land we have left is a misery compared to what the rich owners have amassed with the labor of our grandparents,” Seron said. “I want to occupy the land but the old people are afraid. Most of them work for the old patron and they’re still scared of him. They’re afraid they’ll lose their jobs, and there are no other jobs around here. Most people here have died working for the plantation owners, and they’re trapped in that exploitation because they can’t read or write. The owners claim our grandparents signed the land over to them, but how could they do that if they couldn’t read or write? We young people are raising these questions,” she said. Seron embodies the new protagonism of both youth and women. It’s a potent combination. Seron says part of what drives her and other young people to get involved in community life is the realization that their culture was slipping away from them. That frightens her. October 14, 2014 | Filed under Americas, Blog, Church, Environment, Women.